Hello and welcome to the third installment of "The Theatre of History"! As chosen by you, the community, I now present to you all the Sd. Kfz. 222 or as we like to call it “Scout Car”. In the game, this vehicle is mainly presented as a fighting vehicle, being able to attack infantry and most light vehicles. 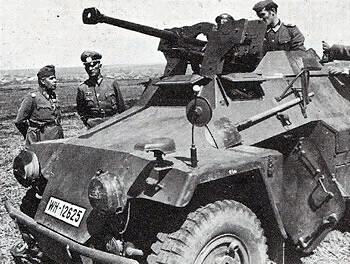 In reality, the main purpose of this light armored vehicle, was to sight enemy emplacements and enemy troops, wherefore the scout cars were gathered in so called “Aufklärungs-Abteilungen” (reconnaissance departments). These departments were part of a Panzer-Division. That’s where its German name “Panzerspähwagen” derives from. Let’s get into the anatomy of this little beast: The “Panzerspähwagen” was developed by the Eisenwerk Weserhütte of Bad Oeynhausen. The vehicle was based on the Horch 108 chassis, which was an off-road-car produced by Horch (today known as Audi) and used as a personnel carrier by the Wehrmacht, mainly for officers or commanders of Divisions and departments. The chassis was combined with thin and sloped armor plates and got a small open-topped turret armed with a blast-shield against grenade fragments. But before the 222 saw any combat, there was a variant called Sd. Kfz. 221 and is mainly the 222 without its 2cm KwK and the single MG34 in its turret. The crew consisted of two men, one being the gunner and the other one the driver. The production of this vehicle started in 1936 and continued until 1940, with a minimum of 339 vehicles produced for the Heer. Some Sd. 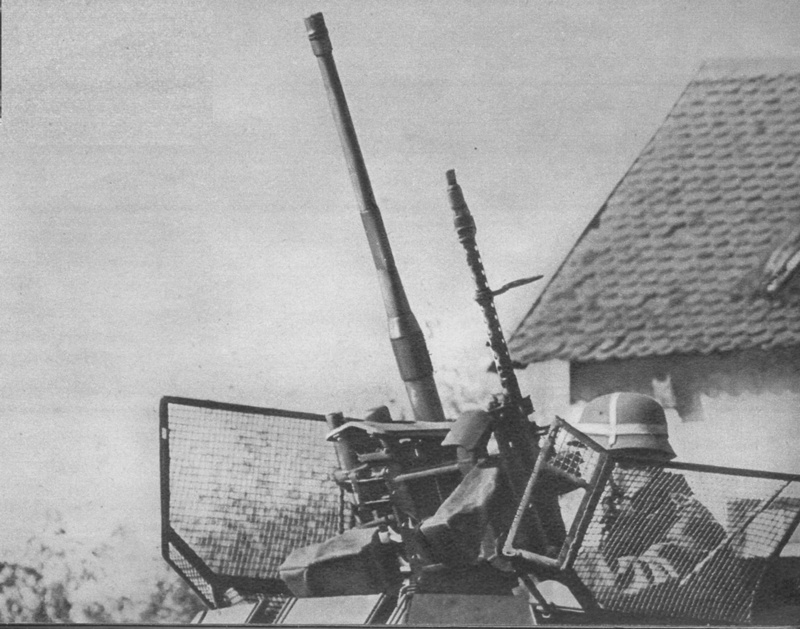 Kfz 221 were rearmed with a 2.8 cm sPzB (schwere Panzerbüchse) 41 "heavy anti-tank rifle" in a modified turret and were used to engage light armored vehicles. A Sd. Kfz. 221 withe the "schwere Panzerbüchse" attached. The anti tank rifle made it possible to fight light vehicles and tanks. Barely one year after the 221 faced production, the 222 was also ready for production in 1937. The main difference in comparison with the 221 was the fast-fire 2cm KwK 30 L/55 gun in the now closed turret and the increased crew which now consisted of three man. The vehicle had a driver, a gunner and a commander. The 222 also was armed with an additional MG34 for self defence against infantry in close combat. In 1942, the vehicle was modernized. It was equipped with an improved version of its 2cm-gun (the KwK38) and the so called “Ausführung B”-chassis, which increased the armor values of the 222. Also, a new and stronger version of the Horch-engine was equipped, speeding up the vehicle up to 80 km/h on roads and up to 40 km/h on offroad-terrain. The improved 2cm KwK38 L/55 ready to give AA-support. Notice the turret mounted MG34 for infantry defence. As stated in the beginning, the Panzerspähwagen was part of the reconnaisence-department of every Panzer-Division the Wehrmacht had. Its main task was to spot enemy armored groups and to reveal their position to the main armored departments of the division. The 222s played a big role during the “Blitzkrieg” against Poland and France with guiding the Panzer-Divisions through the battlefields. But not only the armored divisions had their advantage of these vehicles. Often, they spotted targets for artillery departments, or the supported the infantry in close quarters combat. After the Blitzkrieg in France, the Panzerspähwagen wasn’t used that much anymore, because of its struggle with the terrain on the Eastern Front or on the African battlefield. Due to the fact it had no tracks, the vehicles were more and more replaced by light tanks like the Panzerkampfwagen II, which could deal better with snowy or muddy terrain or the sand and dust of the African deserts. 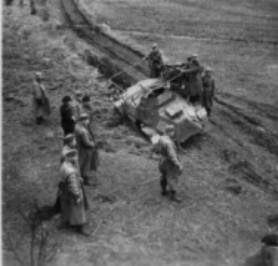 A Panzerspähwagen stuck in the Russian mud. I hope you enjoyed the third installment of “The Theatre of History”. Be sure to check out the voting poll to vote for the next unit, you want to see in “TToH Episode No. 4” and to leave a comment with your opinion about this episode.